Long story short, we are a family of 6. We have four sons ages 19, 17, 15, and 12. Our oldest lives in the college dorm, but comes over from time to time (sometimes with friends). We almost never eat out, we don’t have cable, and we drive old vehicles. Our health care/insurance costs are amazingly low (praise the Lord!). But…we spend a boat load of money every month on groceries. Eeeeek! Almost every month, we fork out somewhere between $800-$1,100 dollars for food to feed our family. Yep, sounds a little scary to some of you. We used to get away with much less back when all four of our boys could share one apple for a snack and be fine until they ate their tiny little dinner. Now it’s just not possible. Our four boys are teenagers now. They are tall. They are extremely active. We care about wholesome nutrition. Our grocery bill reflects all of this. 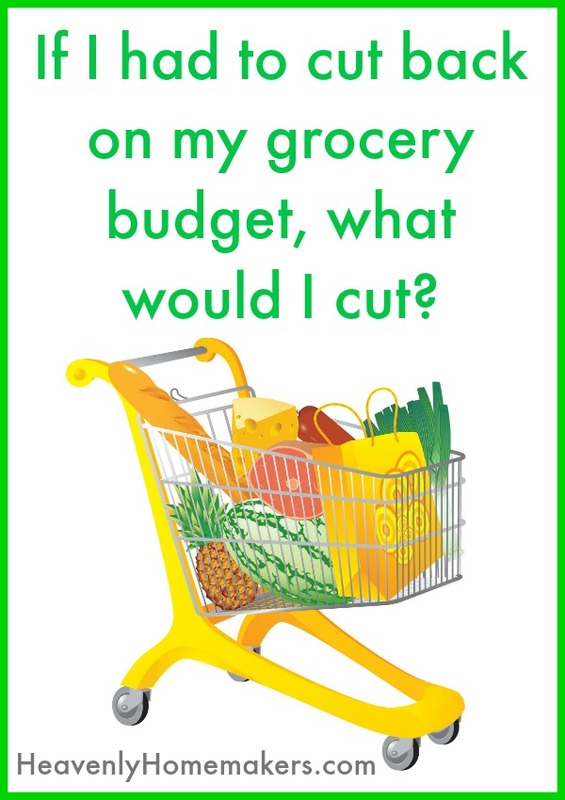 If you had to cut back on your grocery budget, what would you cut? I open my mouth in an effort to answer, and nothing comes out. Of all our groceries, what would I not buy? What do I buy that’s a splurge that I could give up? How could I cut back? Honestly, I’m not sure I have a good answer. I buy food. My family eats it. We waste almost nothing. Okay, here’s one. Sometimes I splurge and buy juice. This is fun, but not a necessity. We could give that up, which would save, what? I buy La Croix sparkling water, and this is a total splurge. It’s a fun drink that I could give up. Again, this offers a savings of just a few dollars every month. Could I (tearfully) give up on buying a grass fed cow every year? Maybe. But even with that, would I really be saving money? Buying our meat in bulk like this really cuts the cost down. And speaking of cows, I really can’t skimp on the meat at our house, as far as quantity. I feed my boys plenty of rice, potatoes, and pasta to help fill them. But they never feel satisfied without substantial protein. How about produce? The thought of cutting back on fresh or frozen fruits and vegetables makes me feel sick inside. Our bodies need nourishment from these, and I would hate to cut back. Fruits and veggies are a big part of our meals, and I believe the variety of nutrients they provide helps to keep my boys feeling satisfied, especially when compared to cheap crackers or whatever else I’d offer to fill in the gaps. We already skip the milk. We buy one gallon each week (to use for cooking) from a local farmer, so it is organic and grass fed. But one gallon. For $5.00. It’s more expensive than store-bought, but the $20 I spend on milk each month doesn’t make or break my budget. My family eats a lot of food. That, and we feed extra people quite frequently. Our grocery budget allows for including extras around our table regularly, and for that, I’m extremely thankful. I wouldn’t want to ever give that up, and God continues to provide so I don’t have to. But truly, if I had to cut back on my grocery budget, I think my kids would be hungry. Either that or I think they might get sick more frequently. There’s no way to know that for sure, I guess, but after so many years of filling them with nourishing foods, including a lot of fruits and vegetables, I really think their bodies are thriving on the nutrients. To cut back and substitute them with “filler foods” could potentially hurt them and make our doctor bills increase. Worth it? Absolutely not. This is where I land for my family right now. If our income decreased and we would need to cut budget in order to make it, food would be one of the last things I would/could adjust. And I know, without a doubt, that God would provide for my family’s needs. He is God and we never need to doubt him. What are your thoughts on this topic? If you had to cut back on grocery spending, what would you/could you cut out? Sign up to join our Heavenly Homemakers Savings Club here. Also for Savings Club Members, we just finished a project we started a couple years ago (no time like the present, right?). Another NEW Freebie for you! If you’ve been reading here for a while, you might remember that about two years ago (I’m embarrassed that it’s been that long!) I asked all of you to submit your best ways of saving money on real food. I FINALLY compiled these into a fun downloadable resource for you! 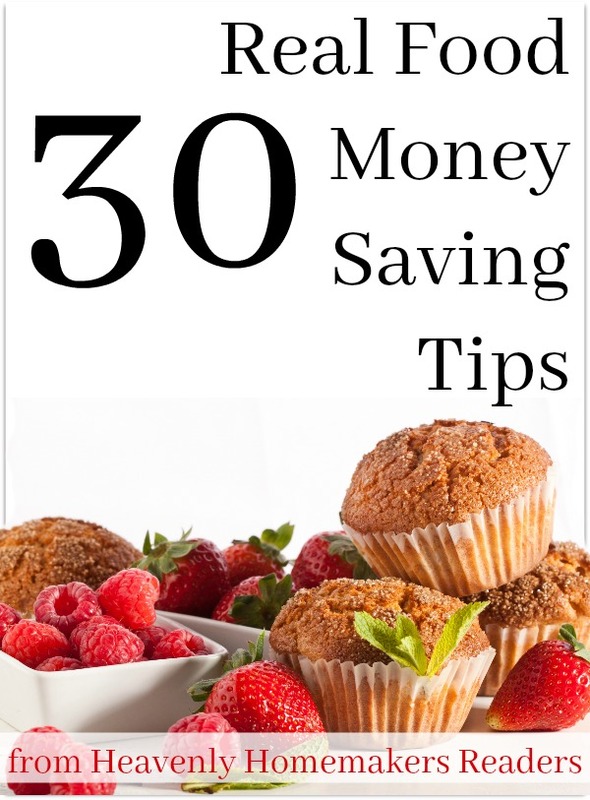 This eBooklet is full of 30 Real Food Money Saving Tips. This resource is super practical and easy to read through. I bet you’ll find some ideas you hadn’t thought of before, some that you can work toward now, and some that might benefit you in a different season. 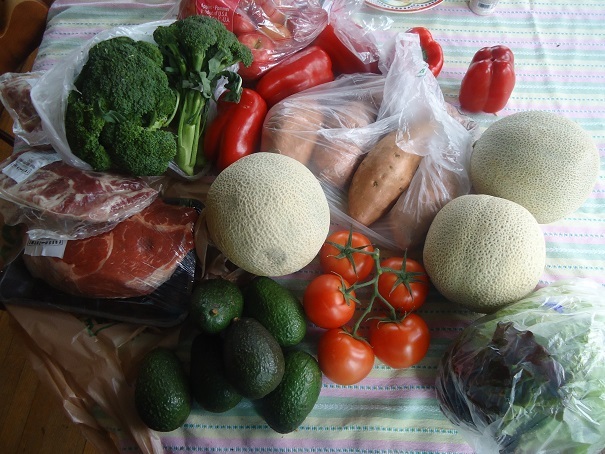 What are your best ways of saving money on real food? We spend 1400 to 1600 per month on food and household goods for our family of 8. We have 2 teens, a 9 year old who eats like a teen and some littles but I’m with you its worth it and God always provides! Been there. I used to buy only organic and skip those fruits and vegetables that weren’t. 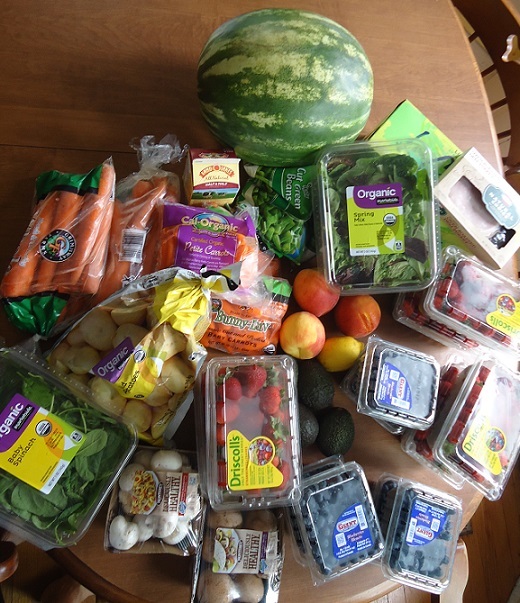 Then I realized I was eating only carrots, kale, tomatoes, apples, and frozen strawberries because of prices. Rarely I’d be able to get a peach. All those are healthy, sure, but man does it get sad walking through a market and avoiding most foods. I stopped that a few years ago and just decided to enjoy fruits and vegetables rather than being worried about them because they weren’t organic. I think the release of stress (from feeling highly restricted) alone was enough to make the switch worth it. 1) watch produce sales, but also seasons. Citrus is much cheaper in the winter and early spring, strawberries are affordable now, peaches in the mid-summer and pears in early fall – the sale prices in season are noticeably better than other seasons. 2) look at the per-serving price of some of our favorites and serve the more expensive meals less often. For me, a chicken casserole is much cheaper than a pot roast and fills my family comparably. Beans can stretch the meat for tacos. Adding a homemade bread or pan of rice helps make smaller servings of an expensive entree work. Like you, I can’t serve a vegetarian meal very often at all! We need our meat, but not necessarily a half-pound each! ???? 3) gradually adjust your budget to allow bulk purchases. When a truck comes through town selling strawberries for half the grocery sale price, I might buy $100 worth and freeze them. If I have freezer space, I can buy 80 lb of ground beef from Sam’s for $2.50-3.00/lb rather than the $5/lb I’d pay for 1-lb at a time at the grocery store. The local produce wholesale store allows customers to walk in and buy whole cases (usually 40 lb) at wholesale prices (apples <$1/lb). But I've been surprised by how many people tell me "I don't have the money to buy that in bulk this month" even the small minimum at Azure Standard! It's so worth the effort to shift your budget and storage space to allow for buying beef this month and oatmeal next, etc. Laura, I’ve been considering buying meat in bulk from Zaycon. I live in SC and they deliver to a church near my home. Many people online rave about the quality of their products. They buy directly from farmers. I would classify their products as clean commercial (like I purchased back in the day from my food co-op). You know not organic, free range, or grass fed but supposedly better than your typical grocery store. I’d love your opinion on Zaycon if you know folks personally that buy from them or what you have heard regarding them. I think Zaycon is a great option! I would buy from them but I’d have to drive to Lincoln (an hour away) at a set time and find that at this stage of my life, that wouldn’t work for me. If you have a good option near you, I say go for it! We love zaycon. The quality is extra great. As always timely post. My husband and I were reviewing our budget last night. Question for you though, that doesn’t really fit here, what do you do in the winter for produce? I ask because this past winter I was struggling to find produce that tasted and looked good enough to buy. I’ve read your blog for about forever now. ?I just love your style. Thanks for keeping at it. We recently went through a job change and took a major pay cut, which took my grocery budget from $750-800 to absolutely no more than $400 a month. We have 4 boys 19(also out of the house) 17, 10, and 9. We also often have “extra” people over and take meals to people in our church I had been grain free for the last year. It has been a hard adjustment. I’m am now eating some grains, and we eat a ton more filler foods. We still get enough produce just not a ton of variety and only what’s cheap or on sale. That said, God does indeed bless(even regular ole ground beef) and there is always enough. Jennifer, My family is here now. No job. I am not sure how to do this. Never had to before. Lord’s blessings on you and your family!! I would love to know some of your best tips and how you made decisions for your food changes, priorities and such. Hi Tammy, I’m so sorry to hear about your job situation. Praying right now for employment for you family. First off I am no expert by any stretch of the imagination and I screw up regularly. Secondly (and I know for some people this isn’t an option but…) If your family has no employment I would personally seek assistance through SNAP/Food Stamp/ EBT whatever it’s called where your from. It is a good short-term option and really what the program is there for. So all that said :) I try to be a little bit ahead each week. For instance, this week Pork Roasts were on sale for 1.69/lb so I bought one, cooked it Monday/ had leftovers for lunch and immediately split the rest into two bags for this next week. I did that with a ham and a whole chicken last week. Laura has great recipes here, Prudent Homemaker is another great blogger for inspiration. Fruits, veggie sticks, and sometimes home baked items as snacks. Only taking cash to the grocery stores, shopping sales, making my menus first around what I have in the house, bulk/freezer cooking/ meal prepping one night a week. Honestly it takes a little extra time, planning and intentionally not letting things go to waste. So priorities…feed my family :) sincerely that’s become my main goal, then try to get as much produce in them as possible filling in with rice, pasta, oats, breads and meats, and trust God will bless. I know many around the world would gladly take my “low” budget. Oh also real butter….only real butter, I can’t go back to margarine we just eat less of the real stuff. Lastly letting go…my kids can eat a hot dog and it doesn’t mean I’m a bad mom. God is with you and He will help stretch those loaves and fishes. Good Luck to you and your family! I guess I should add, we drive old cars, buy used clothes, we do not have cable, we also rarely go out to eat. These are great tips. Also, if there’s any way possible, growing some of your own produce (even if it’s just lettuce, bell peppers, and tomatoes in pots) can help supplement your groceries–and you control how it’s grown. Another good resource for recipes is Budget Bytes budgetbytes.com Beth has “been there, done that” as well, and also is a pro at stretching her food funds. Always good to see where someone else is at in their “living of life.” That’s my favorite about you–you tell us real life stuff. What a blessing to have healthy mouths to feed. What a blessing to have so many options to feed them. What a blessing to have fellowship with friends. You have a challenged me to find new ways in my area to feed my family good food with what I have. Keep being thankful for your blessings, keep sharing real life with us, keep serving God with what He has blessed you with. We have 3 athletic teen boys (plus mom & dad) and average $1000/month. Right now, we eat beans & rice at least once a week. In trying to hold the line on food spending, I always look at per pound price for everything. When I realized the little box of “healthy” crackers and chips were over $3/lb, I bought more fruit and veggies for less than $2/lb. We eat at least one vegetarian meal per week–rice and beans. They may eat 2 or 3 servings, but it always fills them up for less $$ than meat and dairy. Since we homeschool, I try to cook enough for supper and lunch the next day. Then both those meals are filling and they raid the fridge (slightly) less often. I think when there is absolutely nothing “unnecessary” to cut and nothing you’re willing to sacrifice, and you don’t buy a lot of “brands” that you could switch since you already eat as close to the earth as possible, well, you know you’re doing something right! We eat out one dinner and one lunch a week, which could go, if push came to shove. But we also see that as our “entertainment” since we don’t go to movies, amusement parks, or other entertainment type things that cost money. I also buy some convenience foods, like cold cereals, but those could go too because they are just that – a convenience. And my kids actually prefer homemade granola and plain old oatmeal anyway. For our family of three (and just one almost 13-year-old male swimmer), we keep our grocery costs under control by eating what we can from our garden/pantry, buying in season/stocking up when there are sales, and focusing on eggs (from our chickens), beans, and poultry for most of our protein–with a little bit of “good” beef, a little bit of wild caught salmon, and the occasional cut of pork thrown into the mix. Most of our meals are “from scratch” since I have to avoid soy (which is in so many commercially made products). Honestly, I am about on the same page. We are a family of 8, two adults, a 10, 8, 6,3, 2, and 1.5 month old. I can’t really think of much I can cut except for in the meat department, lol:) I don’t buy organic unless the price is fairly similar (just bought organic lettuce today at the same price as non-organic) and then I just trust God to take care of everything else! I would love to afford organic everything, but it’s not possible on our budget. We buy lots of fruits and veggies (as seasonally as possible), generic brand oatmeal, lots of noodles, rice, etc. We do buy local raw, organic milk at an EXTREMELY reasonable price ($2.50 per half gallon), grass fed beef from the same farm, and “naturally” grown chicken from the store. So if push came to shove, I COULD buy cheaper meat from the store and non-organic, non-raw milk from the store, but since we can afford it and I think it is better for you, we will stick with what we are doing. Plus, the savings would probably only be a couple of dollars a week, which does add up, but my husband and I both feel very strongly about buying our milk and meat the way we do, so we will continue to do so until led otherwise. :) Thanks for sharing your encouraging words, as always! Oh Laura, you are in such a happy place! Doing armfuls of love for you dear ones! Keep doing what you are doing. Budgeting for the best food for your family. You haven’t made an idol of it, you are using it for nutrition and for helping those of us outside your home circle. Bless and be blessed, 8-) I heart what you do! hee hee! Laura i am grateful for your honesty!! My husband lost his job 13 days ago. I went last week to a local ministry that helps in situations with food. They asked my typical food budget and i said 850.00 a month. I was laughed at and i quote *well, not anymore*. I was stunned. So i say all this to say thank you for sharing openly with us. I am also thankful to all the ladies here giving tips. There is now a new way of life for us. I want to do it well and i appreciate to know i am not crazy on what i used to spend, or on what i will spend now. Lord bless you all!! Either way if you are on the high side of food budgets or lower side, God bless you for wantin to love your families and nourish them. No judgments!! Grateful. Tammy, I appreciate you sharing this as your husband’s job loss is a brand new challenge for your family. Keep in touch to let us know all the great ways God provides for you as I know you will have great stories to share of His faithfulness. Praying for you! 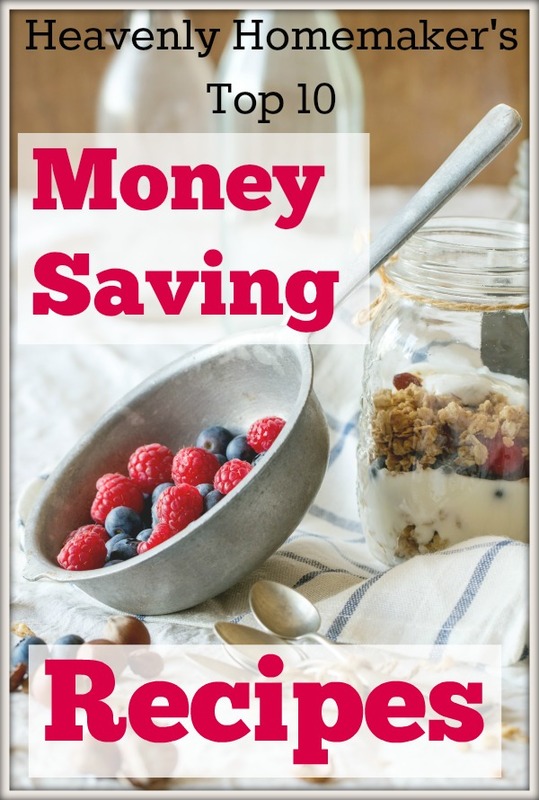 If you’d like some very practical tips on living a frugal lifestyle, I recommend The Prudent Homemaker blog theprudenthomemaker.com The author, Brandy, is an expert at stretching her funds–she’s had to be. I’ve learned a lot from her blog. Yes, indeed, God does provide. And if you suddenly found yourself in circumstances where money was extremely tight, you would find ways to cut the costs. Many have. Thank you for sharing. I see all these bloggers feeding their family for a few hundred dollars a month… That just is not happening for me. We have two active parents, one teen boy and two children under 8 who sometimes eat a lot, other times not so much. I see we share some of the same values regarding nutrition. 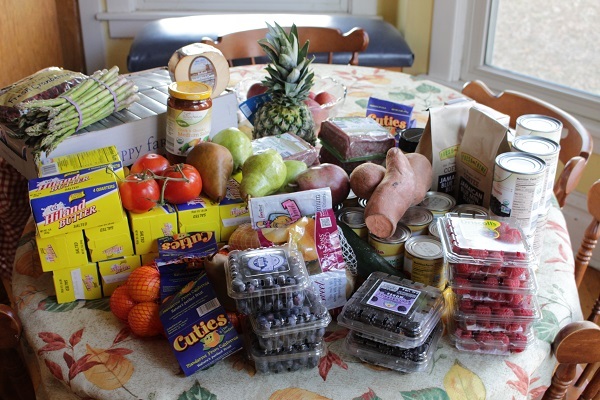 I spend $700-800/month on food, about $600 of which is at the grocery store (Aldi!) and the rest on bulk orders online. Buying one grass-fed cow and two small pastured pigs ($200 goes into savings for this each month) keeps our meat costs as low as I’m willing to take them. You’re doing a fabulous job. I think I need to go reread some of your grocery posts. We spend 1200-1500 (5kids) we are a family of 7 soon to be 8. 3 of my kids do have celiac so we ear mostly GF. We don’t splurge often either. Good real food just costs money and so does feeding a bunch of kids.